I'm very excited to welcome Danelle Harmon to Love Saves the World. Danelle is currently on a virtual book tour to promote her de Montforte Brothers series and I asked her to do a guest post where she talks about what she does when she isn't writing. Danelle will be awarding a digital copy of book two, "The Beloved One" to one randomly drawn commenter at every stop and a $25 Amazon GC to one randomly drawn commenter during the tour (INT). Make sure to drop by her other stops! For links, click here. Playing with my dogs... We have four German Shorthaired Pointers ranging in age from one to fifteen years. This is a difficult breed, and one I don't recommend to anyone who doesn't have a lot of time to devote to them and room for them to run, as their exercise requirements are huge, but I guess I'm a sucker for punishment! They are so devoted and a lot of fun, and they make me laugh, as they never really grow up. My male, Marcus -- handsome and flamboyant -- is an AKC champion and also has his Canine Good Citizen title, and our puppy, Tansy, just got her first championship point. I've spent many a morning getting up before the sun to trek off to a dog show! I also do a lot of volunteer work including fostering for dog Rescue, and have recently been asked to write a bi-monthly column for our national breed publication by our national rescue chair. This is an honor... and something I think will be every bit as challenging as writing a book! It feels good to help save a life. Reading... I like straight historical fiction, or even a suspense or two such as something by Dean Koontz or Tess Gerritsen. I actually don't read a lot of romance, as I don't want others' influences to creep, even subconsciously, into my own work. I think this helps to keep my own stories fresh and (hopefully) original. Right now I'm reading a great biography by Samuel A. Forman about the young and handsome Dr. Joseph Warren, a forgotten hero of the American Revolution and one of my favorite historical figures. He's likely to find himself into a future book. Dr. Warren, that is -- not his biographer! Riding my horse... The largest member of our family, Ben Azi, is a grey Arabian. His great-grandsire, Nazeer, was an Egyptian racehorse, and he traces in every line from horses imported from Egypt. Though Arabians are the go-to choice in romance novels, they are often portrayed as "huge," which really clashes with reality. The true Arabian horse is a smaller animal, often technically "pony size," and most of our romance genre's 6'-plus heroes would look sadly underhorsed on them, though in reality, the Arabian is renowned for its ability to carry more weight for its size than many other breeds, and is the preferred choice for those who compete in endurance. Ben Azi doesn't know he's a horse, though. He thinks he's a dog, begs at the back deck during suppertime (he likes pizza and potato chips), and has taken good and gentle care of our daughter ever since she started riding him at age two. He is a wonderful companion! Listening to music... My tastes are varied. I wrote much of the de Montforte series to the hard-driving music of the British band Oasis, which was huge when I lived in England... it never found as much status here in the states as it did in the UK, but I remain a devoted fan. I need energy when I write -- I think it finds itself into my writing, or at least I hope it does! From Madonna to the Bee Gees to Blur, my iTunes library is pretty eclectic! Kicking back and spending time with my family... I met my English husband in 1994; he was living in Oxfordshire, and I was here in Massachusetts. By the autumn of that year, I had moved myself and my dog, Roscoe (that's him on the cover of THE DEFIANT ONE, and he also was the "model" for "Freckles," one of the dogs in that book) to England, and we were married in March of 1995. We live here in New England now, and have a 'tweenaged daughter, Emma... also an animal lover! I also devote time to other obligations: I'm on the Vestry of my church, am trying to learn Photoshop (I think it's defeating me), and have a long-standing interest in miniatures, where I've made a modest part-time income as a model horse artist during the years of my writerly sabbatical. Thank you for taking the time to host me today on your blog -- it has been a pleasure to be here! Thank you, Danelle! I'm so happy to have you visit my blog! Multi-award winning and critically acclaimed author Danelle Harmon is the author of ten books, previously published in print and distributed in many languages throughout the world. A Massachusetts native, she married her English husband while living in the United Kingdom, and both now make their home in Massachusetts with their daughter Emma and numerous animals including four dogs, an Egyptian Arabian horse, and a flock of pet chickens. "Just what on earth are you doing, Lord Gareth?" The way she said it made his cheeks warm with embarrassment. So he was a pillock. Who cared? Instead, he gave her his most devastating grin and said with cheerful earnestness, "Why, I have come to rescue you, of course." "Surely you didn't think I'd allow Lucien to banish you into obscurity, now, did you?" "Well, I -- The duke didn't ban -- She gave a disbelieving little laugh and leaned out the window, grasping the blanket tightly at her breasts. Her hair, caught in a long, dark braid, swung tantalizingly out over her bosom. "Really, Lord Gareth. This is... highly irregular!" "Yes, but the hour is late, and as it took me all day to find you, I was feeling rather impatient. I do hope you'll forgive me for resorting to such desperate measures. May I come in and talk?" "Of course not! I -- I cannot have a man in my bedroom!" "Why not, my sweet?" He pushed aside a small, leafy twig in order to see her better and grinned cajolingly up at her. "I had you in mine." She shook her head, torn between what she wanted to do -- and what she ought to do. "Really, Lord Gareth... your brother will never approve of this. You should go home. After all, you're the son of a duke and I'm just a -- "
" -- beautiful young woman with nowhere else to go. A beautiful young woman who should be a part of my family. Now, do collect Charlotte and your things, Miss Paige -- I fear we must make haste, if we are to marry before Lucien catches up to us." "Marry?!" she cried, forgetting to whisper. He gazed at her in blank, perfect innocence. "Well, yes, of course," he said, clinging to the branch as it dropped another few inches. "Surely you don't think I'd be hanging out of a tree for anything less, do you?" Wounded in battle, Englishman Charles de Montforte has awakened to find himself in the tender care of a sensuous, sloe-eyed local miss, whose beauty would be a joy he would treasure always... if only their paths had crossed in some other place and time. Charles' heart is profoundly moved by Amy Leighton's desperate plight, and her curvaceous dark loveliness and gentle, healing touch are enflaming his desires. But the noble British lord is already taken, though Amy soon lures him away from past loyalties to Crown and fiancée with a golden, rapturous promise of love happily forever after. Amy has long prayed for someone special to enter her life -- someone who would take her far away from the daily drudgery imposed upon her by a cruel, unloving step-family. Now fate has brought her the strong yet gentle man of her dreams; but the handsome stranger is from an enemy land... and he's sworn to love another. Blessed -- or perhaps cursed -- with a fiery temper, a strong will, and a blatant disregard for his brother's wishes, Andrew's only desire was to be left alone. But after being caught in a compromising position with tempting Lady Celsiana Blake, the defiant Lord Andrew is forced into marriage. This solitary man knows he has been duped by his brother, for Andrew would never have taken the lady into his private chambers if it hadn't been for the Duke of Blackheath's machinations. After all, the reluctant groom's sudden, unbidden desire for the woman who would be his bride could only be called a mere chemical reaction -- or was it something more? Celsie can't account for her shameless behavior with the brilliant but brooding lord she was to wed. So how was she supposed to act now that she was sharing her life with him? There is only one thing a new wife on the verge of falling in love can do -- try to win her husband's wary heart. The head of his noble family, the dark and dangerous Duke of Blackheath spends his time manipulating other lives without giving a thought to finding a wife of his own. Yet Lucien must admit he finds exquisite Eva de la Mouriére most intriguing. What adventurous, red-blooded male would not be intrigued by a flame-haired beauty who appears in his chambers demanding that he make love to her? Certainly this hot-tempered minx would make a delightful bedmate -- though surely not a bride. Eva knows Lucien is the cause of all her current misfortunes, yet he refuses to be humiliated. But the worst betrayer is her own heart. No match for Lucien's seductive mastery, Eva craves the blackguard as she's never craved another. She must resist this rogue, but how long can she deny her own passion -- or Lucien's blossoming genuine love -- in the face of his scheming family's successful attempts to force a wedding? Danelle will be awarding a digital copy of book two, "The Beloved One" to one randomly drawn commenter at every stop and a $25 Amazon GC to one randomly drawn commenter during the tour. (INT). *One entry per household, per IP address. *This giveaway will run until August 7. 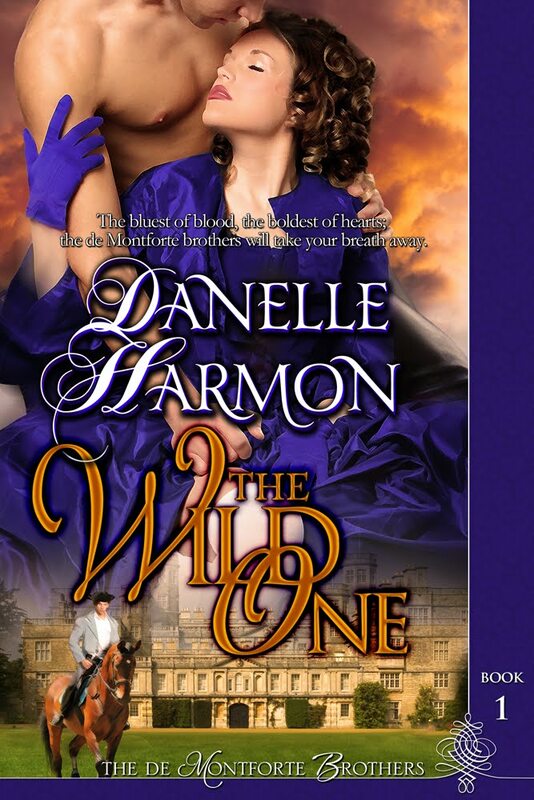 *Rafflecopter will select one (1) winner who will win an e-copy of The Beloved One by Danelle Harmon. Thank you for hosting Danelle today. It is wonderful to be here; thank you so much for hosting me today, Tin! I love how you set up today's stop -- very pretty!! In my family, I'm definitely The Quirky One (though we're all rather nuts! )...this sounds like a great series. So very cool about you miniatures! You must be wonderfully creative. Thank you for dropping by and helping me welcome Danelle! I'd be The Lost One! I'm absent minded & a total klutz. 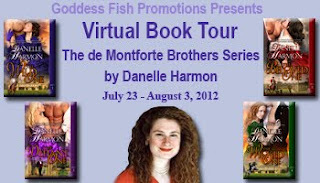 Danelle is a new author to me & the books look awesome; heading to check them out! I would be The Wild One. Thanks for the giveaway !